7 July 1907: Entered the Royal Bavarian Army as a Fähnrich in the Royal Bavarian 3. Infanterie-Regiment Prinz Karl von Bayern after passing out from the Bavarian Cadet Corps. 22 April 1908-30 April 1909: Detached to War School München. 2 August 1914: Adjutant of the I. Battalion of the Bavarian 3rd Reserve Infantry Regiment in the field. 7 March 1915: Leader of the 1st Company of the Bavarian 3rd Reserve Infantry Regiment. 28 September 1916: Detached as Ordnance Officer to the staff of the Bavarian 1st Reserve Infantry Brigade. 11 October 1916: Regimental Adjutant of the Bavarian 2nd Reserve Infantry Regiment. 9 April 1917: Prisoner of war in British captivity. 25 October 1919: Released from captivity into the Wilhelmshaven Transit Camp. 27 October 1919: Returned to the Bavarian 3rd Infantry Regiment and on leave to Augsburg. 23 December 1919: Returned to service in the Bavarian 3rd Infantry Regiment. 19 January 1920: Company Leader in Reichswehr Infantry Regiment 47. 16 June 1920: Ordnance Officer on the staff of Reichswehr Brigade 24. 1 October 1920: Captain on Staff of Reichswehr Infantry Regiment 48. 1 January 1921: Captain on Staff of Infantry Regiment 20. 1 March 1921-31 May 1921: Detached as Captain on Staff to the I. Battalion of the Wach [Guard]-Regiment-Berlin. 1 October 1922: Chief of the 7th Company of Infantry Regiment 19. 18 September 1924-15 October 1924: Detached to the Machinegun Course at Troop Training Area Grafenwöhr. 1 October 1926: Captain on Staff of II. Battalion of Infantry Regiment 19. 1 October 1928: Detached to the Reich Defense Ministry/AHV. 1 December 1928: Transferred to the Reich Defense Ministry/Department of Army Technical Schools and Maintenance Services (Vers). 1 February 1931: Commander of the Training Battalion of Infantry Regiment 19. 1 April 1934-1 May 1943: Commandant of Troop Training Area Grafenwöhr. 1 May 1943: Führer Reserve in the Army High Command and, at the same time, detached to the Commandant of Rear Army Area 550. 1 July 1943: Delegated with the post of Commandant of Rear Army Area 525 of the 20th Mountain Army in northern Finland and Norway. 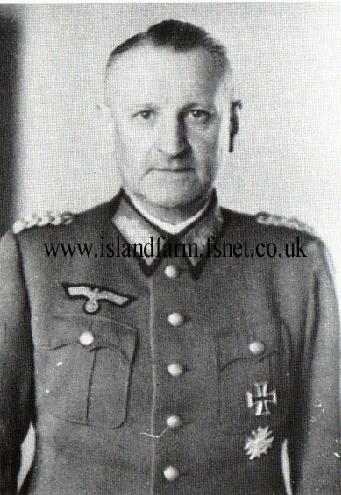 16 October 1943-8 May 1945: Commandant of Rear Army Area 525 of the 20th Mountain Army in northern Finland and Norway.